OXFORD, Miss. 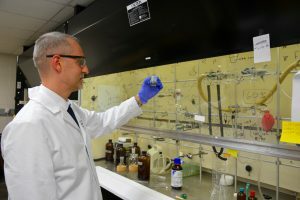 – David Colby, a University of Mississippi School of Pharmacy professor, received a grant from the National Institute on Drug Abuse to develop new treatments for addressing the opioid crisis. David Colby’s lab is working to develop new treatments to address the opioid epidemic. Through this research, Colby’s lab discovered a new class of compounds that have the potential to treat addiction more effectively than existing therapies. Adam, as well as second-year student pharmacists Tori Clearman and Demi Leara and pre-pharmacy student Madeline Griffin, are all integrated into the work of Colby’s project. Clearman, a native of Meridian, Mississippi, said the opioid crisis was a main motivator for her to attend pharmacy school and that she hopes this opportunity will help her accomplish her career goals. Research reported in this publication was supported by the National Institute on Drug Abuse of the National Institutes of Health under Award Number R15DA046795. The content is solely the responsibility of the authors and does not necessarily represent the official views of the National Institutes of Health.